Facebook junkies rejoice: The HTC Status smartphone is coming to AT&T and Canadian wireless provider Telus this summer, HTC has announced. The Status, with its BlackBerry-like design, may not be the most cutting-edge phone, spec-wise. But it does provide deep integration with Facebook, a boon to social-networking fanatics who need to keep the world apprised of their every activity. The HTC Status has a Facebook share button below the phone's physical keyboard. The button provides immediate access to the world's most popular social network, thereby making it easier for users to upload photos and share their pithy observations. When a Facebook friend phones, the caller's profile photo and latest status update appears on screen. And here's a plus for forgetful types: If the caller's birthday is that week, the screen will show that friendship-saving info too. 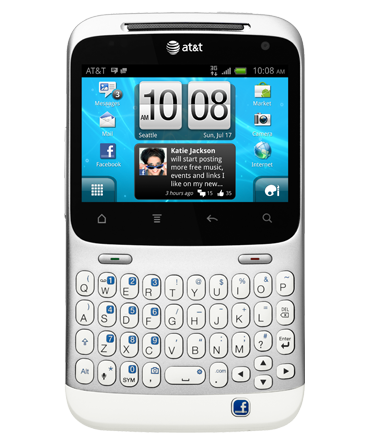 The HTC Status runs Android 2.3 and has an 800MHz processor, as well as a 2.6-inch, 480-by-320 pixel touchscreen. The 5-megapixel rear camera has auto-focus; the front-facing camera has ho-hum VGA resolution and is best suited for video chat. Pricing and availability for AT&T and Telus customers has yet to be announced, according to the HTC Status Facebook wall.